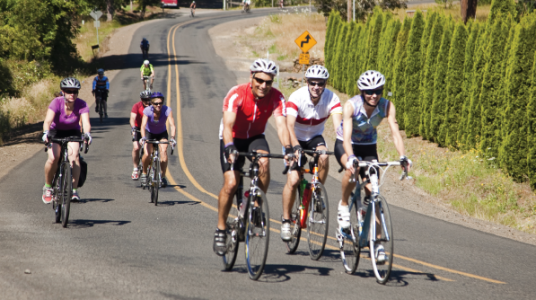 If you’re prepping for a big ride this summer, like perhaps one of the multi-day ride experiences presented by the ride experts at Cycle Oregon, a little organization goes a long way. Here are a few of our top tips to ensure you’re ready with the big event comes. We all say we’re going to train, but too often life gets in the way. Don’t let life get in the way! Make plans now with some friends. The accountability of planning with others works wonders. If you’re a regular distance riders, just a few good days on the bike will be all it takes to limber your legs in time for the ride. Supported rides are an excellent way to meet new riding buddies so if you don’t already have a posse, that’s okay! Rides around here are absolutely stuffed with awesome, friendly people. But if you DO have friends who love to ride, bring them out for the event! It’s so fun to share the ride with friends. Bike shops are busy in the summer. Bring your bike into your favorite shop at least three weeks prior to the ride to ensure there is plenty of time for basic maintenance and any special parts that might need to be ordered. The ride is so much sweeter on a well tuned ride! 4) Be confident: You’ve got this! Fuel your body for an awesome ride! It definitely pays to eat well the week prior to the ride, with heavy doses of protein, vegetable for nutrients and plenty of water. Try to incorporate healthy eating into your season to give yourself a stronger ride potential. It is amazing how much of a difference food can make. If you’re riding hard, training and focusing on improving your rides, that’s awesome! Reward yourself with healthy and even not-so-healthy treats. A relaxing moment with a yummy treat to celebrate a job well done will help get you psyched for the next adventure. Positive rewards work! 7) Need a new ride idea? Our calendar lists all sorts of rides happening all summer long. The season of riding is NOW and Cycle Oregon offers some of the best support possible. You have enough to worry about in your daily life; let Cycle Oregon take care of your bike vacation details for you. Wine Country. This one’s for the ladies (sorry, fellas, if you really want to be there you can volunteer at the event). BEST WEEKEND EVAH! A weekend of daytime biking and nightly fun with on-site lodging and camping options. Stoic peaks frame the impossibly deep canyons of Eastern Oregon on this stunning ride. Bonus: The ride lands in Pendleton just in time for the Pendleton Roundup! This brand new two-day gravel fest takes you down the hidden roads less traveled to the west of Portland in the Tillamook State Forest. Great Blog … thanks for sharing.